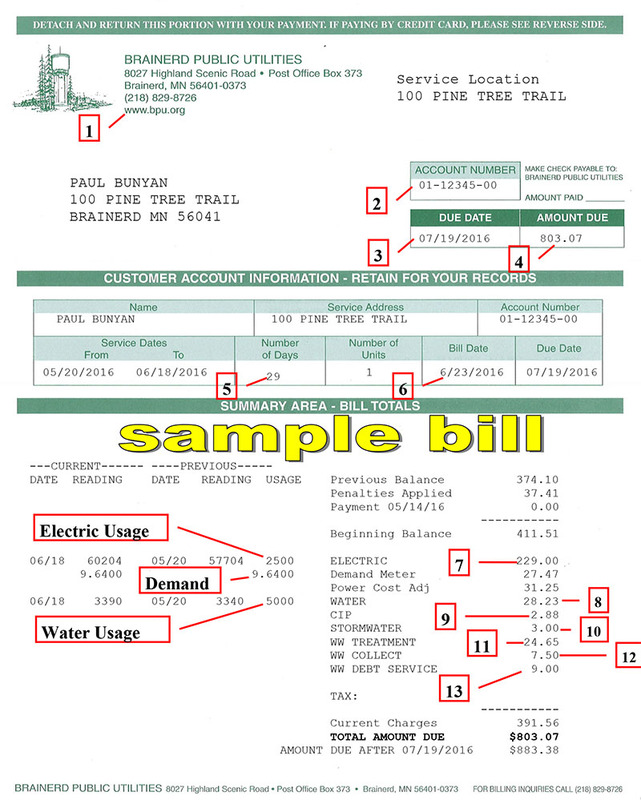 Please refer to this sample bill with explanations of how to read your Brainerd Public Utilities bill, as well as explanations of other charges that may be on your bill found below. Address & Telephone Number – Telephone number to call for billing inquiries and BPU’s mailing address and street address. Account Number – Often requested when you correspond with us. Your account number changes if you move from one address to another. Due Date – Please pay your bill by this date. Amount Due – Total amount of charges owing, including both current and past due charges. Number of Days – Total number of days in the current month’s billing cycle. Bill Date – The date your utility bill is actually billed in our business office. Electric – The charge for the kilowatt hours that you use each month. Water – The charge for the gallons of water you use each month. The service charge also includes a $0.53 Minnesota Department of Health charge to accommodate the mandatory State charge that has been placed on each water meter in the State since July 1, 1992. CIP – A State mandated charge on all electric charges billed to you. The purpose of the Conservation Incentive Program (CIP) is to assist utility customers in becoming more energy efficient and to promote energy conservation. Stormwater – This charge is billed on behalf of the City of Brainerd. The revenue collected for stormwater this charge is used to maintain and improve the existing stormwater drainage system for impervious surfaces (where storm water cannot penetrate into the ground). Residential customers are charged a monthly fee and commercial customers are charged according to the amount of impervious surface their property has. If you have any questions about this charge, please call the City Engineer’s Office at 218-828-2309. See below for more information on stormwater. Wastewater Treatment – The charge is based on your water consumption. It covers the cost of processing your wastewater. Wastewater Collection – This charge also has been added to your bill on behalf of the City of Brainerd to cover the cost of maintaining the City’s wastewater collection system. If you have any questions about this charge, please call the City Engineer’s Office at 218-828-2309. Wastewater Debt Service – This charge is determined by the size of your water meter. The revenue is used to help pay for the expansion and upgrade of the Wastewater Treatment Facility. Penalty – There is a 10% penalty applied to your current charges if they are not paid by the due date. kWh – Abbreviation for kilowatt-hour, the unit in which electricity is measured. One kWh is 1,000 watts used for one hour. The number kWh used depends on the wattage (size) of the electrical appliance and the amount of time it is in use. Demand Meter – Commercial customers that use over 2,500 kWh each month are billed for both kWh and kW (demand). The demand charge is determined during the highest 15 minute period of electric usage during the month. Electrical load scheduling is the key to reducing your peak demand. If you have electric motors, air conditioners or other electrical equipment which are used simultaneously, try to schedule their use at different times of the day or night to minimize peak loads. Power Cost Adjustment – The power cost adjustment recovers the cost of energy used in Minnesota Power’s (Brainerd Public Utilities power provider) generating units and the cost of additional purchased energy required to serve your electric needs. Security Light – A Brainerd Public Utilities customer can have a security light installed for a charge of $12 per month, per light, plus applicable state and local sales tax. Brainerd Public Utilities will install the pole and maintain the security light. Sprinkling Credit – All residential customers will get a sprinkling credit applied to their sewer charges for the billing months of June, July, August and September. The rate goes into effect after the water meter is read in May. The credit is based on your water usage in December, January and February. Deposit Applied – If a customer is required to pay a deposit, according to Brainerd Public Utilities Deposit Policy, the deposit is applied to the customer’s account after 12 months of paying their bill on time; or if a final reading is done, the deposit is applied to the final bill. If the final bill is less than deposit, the remaining balance, if over $5, will be mailed to the customer.